What is the Trans Pacific Partnership (TPP)? In a nutshell, it’s NAFTA for the Pacific Rim. The TPP is a trade agreement under secret negotiation by by Australia, Brunei, Chile, Canada, Malaysia, Mexico, New Zealand, Peru, Singapore, the United States, and Vietnam. Japan will join at the next meeting. Just among those countries, it would be the largest free trade agreement in U.S. history, covering approximately 40% of the global economy, but the TPP is also specifically intended as a “docking agreement” that other Pacific Rim countries would join over time, with Thailand, the Philippines, South Korea and others already expressing some interest. Access to meetings and materials are limited to officials and corporate stakeholders. 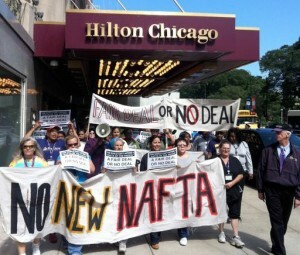 For years, the Trans-Pacific Partnership negotiations have taken place behind closed doors. In the United States, approximately 600 corporate lobbyists have been named as official advisors, granting them steady access to the negotiating texts, as well as the negotiators. U.S agricultural representatives are predominantly Big-Ag supporters, including Monsanto, Dupont, Syngenta, Cargill, Chevron, and Walmart. 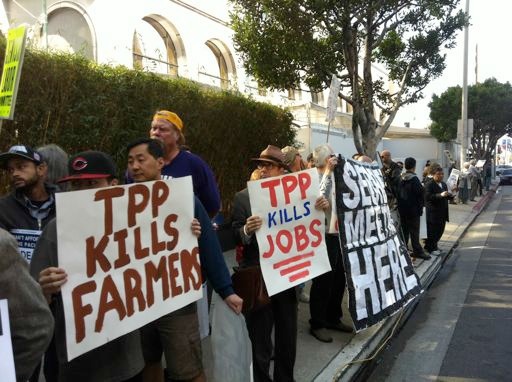 Farmers have been excluded from the negotiations over TPP. Since negotiations began in 2008, none of the negotiating documents have been officially released for public review (although some have been leaked). Most civic groups, journalists and those whose lives will be affected by the negotiators’ decisions have no right to see the texts until the negotiations have concluded — at which point, it is more-or-less impossible to change them. An international “Release the Texts” campaign has, thus far, not been answered. 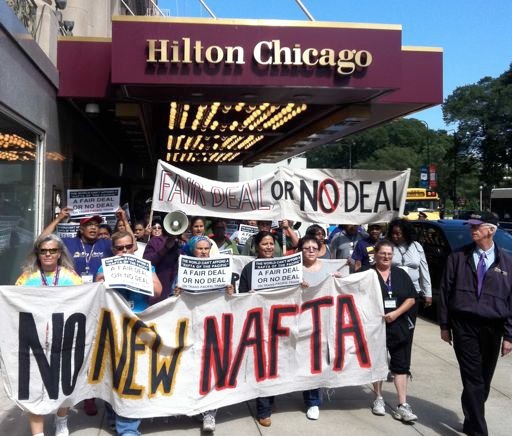 What will the TPP do when in place? The TPP overrides the food security of individual nations, making food simply another commodity subject to economic speculation. TPP promotes export-oriented food production. The TPP will empower large, transnational agribusiness, the global food merchants, to sue countries for trying to limit the kinds of food they import, including genetically modified organisms (GMO). Domestic food safety standards can also be eliminated or weakened as barriers to trade. Due to equivalence rules, as in prior agreements, the TPP will increase risks to food safety in the U.S. For example, it will allow the importation of sub-standard meat products. The TPP will allow transnational corporations to challenge virtually any new or existing environmental law in order to weaken or eliminate it. This includes the Clean Air Act, Endangered Species Act, and Marine Mammal Protection Act in the United States. The TPP pushes further financial deregulation, offering protection to ‘too big to fail’ corporations including Wall Street banks, insurance companies, and hedge funds. It allows these corporations the ability to easily move vast amounts of money across national boundaries, avoiding regulations and taxes. Yet, while TPP countries have agreed to provide foreign investors an array of extraordinary new privileges, the TPP countries have not required investors to agreed to health, labor, or environmental obligations. Free Trade Agreements have historically always undercut the right of local producers to receive a fair, locally determined price for their products by forcing farmers to compete in the global food market. 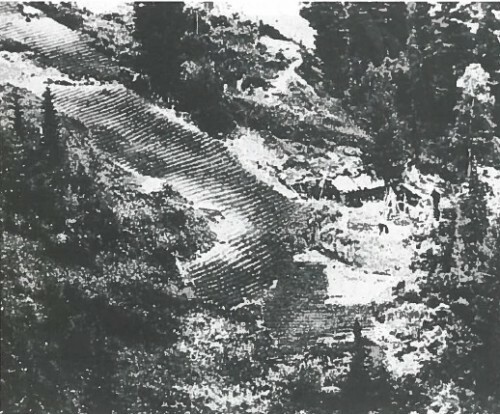 The North American Free Trade Agreement (NAFTA), displaced millions of Mexican corn farmers when cheap U.S. corn flooded into Mexico. The TPP is expected to do the same as it flood markets with cheap products, increasing pressures on small farmers to grow cash crops, rather than traditional food crops. Many environmental, farm and fair trade groups are concerned about the negative impact the TPP could have on where and how dairy products are produced and processed. The U.S. dairy industry generates $140 billion in economic activity and employs an estimated 900,000 workers, while providing nourishment to millions more. The USA cannot afford to compete with dairy imports produced under unfair conditions. Let others know what is going on, contact your congressman, and start building a supply of emergency food storage and heirloom garden seeds. Here is a YouTube video from Congressman Dennis Kucinich warning about the dangers of the TPP. © Plan B Writer’s Alliance – Permission to copy and reprint the text of this article is given so long as reference to the original author and the website http://www.locustsonthehorizon.com are mentioned. Gardens are important, and one of your most important garden tools is a hoe. If you garden a lot, odds are you will use your hoe a lot. Buffalo Bird Woman used one made out of an animal’s shoulder blade for much of her youth (she was 19 before her family even had a metal cooking pot). Unfortunately, many of the ones you find at the garden center of places like Home Depot or the hardware store are cheaply made in places like China. You need to be selective to finding a fairly good one. For those who get super-serious about their hoe, there is the ‘Garden Grubber’ a design tough enough they use a version of it for firefighting crews. An excellent book on traditional Native American farming techniques, which we have also mentioned in other chapters of this book, is “Buffalo Bird Woman’s Garden”. This is a memoir, a priceless gem, originally written in 1917 to document a firsthand account of the old style, traditional Native American farming methods by Buffalo Bird Woman of the Hidatsa tribe in North Dakota. Buffalo Bird Woman lived a traditional existence most of her life, and her family didn’t even have a metal cooking pot until she was 19 years old. This book not only covers traditional gardening methods, but their traditional methods of food preservation, storage, and preparation. Originally documented a century ago as a means to record the past, “Buffalo Bird Woman’s Garden” is a survival manual for the future. 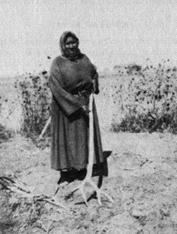 The gardening methods of the Hidatsa, and the similar methods of many other Native American tribes, helped keep the people of this continent alive since at least the end of the last Ice Age.